Pete is the son of a firefighter and Jane Lattimer, and his hometown is North Canton, OH. He has one older sister, Jeannie, who is deaf and taught him how to read lips. It is implied that as a child he was bullied by a Ralph Brunsky, who said he smelled like tuna fish. He was a Boy Scout as a kid, but was kicked out when he was ten for allegedly starting a fire. He claims it wasn't he who started the fire, however. When Pete was young, he and his father would go camping and identify constellations, as well as go to concerts held by his dad's favorite musician. At the age of twelve, Pete's intuition told him that he would never see his father again. He said nothing to his father, because he was ashamed of the fear this feeling invoked. That night, Pete's father died while rescuing children from a fire, and since then Pete has sworn never to ignore his vibes again. Pete was seventeen when he entered Starfleet. 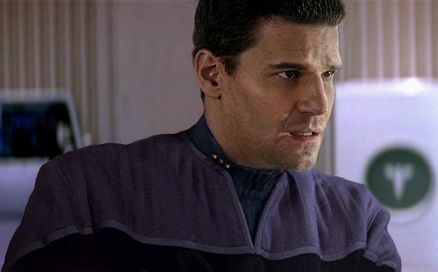 He was assigned to the Enterprise as part of Lieutenant Reed's armory staff for the mission into the Delphic Expanse. He was on the away mission with Major Hayes that rescued Ensign Sato from the Xindi.